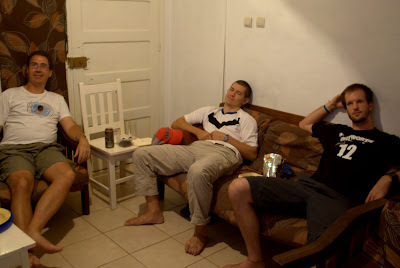 Here's a pic of some buddies who stayed up with me to watch the Superbowl. It started at 1:30AM and ended at 5:00AM Monday morning. I'm exhausted. Question: How good are hotdogs if you cooked em at 1:00 in the morning, left em out and ate them for lunch the next day? I ate em anyway, so I guess we'll find out in about three hours. It's kind of unreal to me to think of you watching the Super Bowl in Africa. I didn't even watch it here! Yeah, it was surreal! Go Packers!